If you read about railways history in the UK you will generally find the story begins in the early 19th century. While it is true that this is the era that saw the birth of the modern railway, the true origins of rail travel began a long time prior to 1800. It could be said that the first railway was the Diolkos, a trackway known to have existed in ancient Greece from around 600BC. Remarkably, this amazing construction actually carried paying passengers. The next we hear of railways is in the mining industry in the middle of the 1500’s, with the appearance of tracks made of stone for wagons in certain parts of England in the early 1600’s. Records show that a landowner, one Huntingdon Beaumont, built a wagonway at one of his mines in Nottinghamshire in 1603, this believed to be the very first such construction in England. He went on to construct three more and remnants of one, at Blyth in Northumberland, can still be seen to this day. The story of rail travel in the UK begins in earnest in the early 1800’s, at first with locomotives powered by the newly developed steam engine concept for industrial use. Richard Trevithick is credited with one of the first operational lines at a mine in Merthyr Tydfil, Wales, in 1804. On seeing the possibilities of steam travel many engineers began to investigate the possibilities, with George Stephenson – an engineer working in the North East – emerging as a leading contender. He is often referred to as ‘The Father of the Railways’ – an accolade that is fitting as he was something of a pioneer. An early problem in railways history was the difficulty in producing long lengths of rail. This was alleviated when Stephenson, working with engineers at the then world leading Bedlington Ironworks in Northumberland, developed a method of making rolled wrought iron rails, which were first used on the now famous Stockton to Darlington railway, the first genuinely workable steam railway in the world. Stephenson’s most famous locomotive, The Rocket, won the Rainhill Trials, a competition set up to find the most effective method of powering locomotives. Rocket effectively set the ball rolling for an explosion in locomotive development. That rail travel caught on in a big fashion is no surprise, for the power of a locomotive was far greater than that of horses. If we consider that, by 1830 – five years after the opening of the Stockton to Darlington line – there were fewer than 90 miles of railway in the UK it would be easy to conclude that things got off to a slow start. Thirty years later, in 1860, the country was connected by over 10,000 miles of track. London saw the construction of a whole family of stations, most still in existence today in one form or another and among the most famous names – Waterloo, Kings Cross and Paddington – in railway history. Other major cities – Manchester, Liverpool, Newcastle and many more – were connected to the capital by increasingly efficient rail networks. During the late 1800’s it was realised that there were few connections between the London stations: the Underground, the first of its kind, was born. 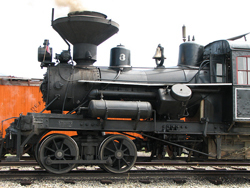 Developments in steam engine technology had seen locomotives become ever more efficient. Notably, however, Europe was beginning to see the merits of diesel and electric engines in railway travel. A notable milestone occurred in 1938 when The Mallard – one of the beautiful, iconic Nigel Gresley designed ‘Streamliner’ locomotives – set a world speed record for a steam engine by topping 126mph. This record still stands today. By the 1960’s the railways had expanded to cover most of the country, yet in 1963 the famous ‘Beeching Axe’ fell, when Dr Beeching advised the closure of a quarter of railway lines and the closure of half the stations in the country. Many smaller – and some large – towns are still without rail connections as a result. The age of steam, meanwhile, was coming to an end and on August 11th 1968 British Rail, which had been formed twenty years before, ran its last ever steam powered train. Steam had ruled for over 140 years, a remarkable achievement. The future saw diesel and electric trains come to the fore, the introduction of high speed railways, the privatisation of British Rail and – the crowning glory for many – the completion of the Channel Tunnel. Still, it is steam that holds the attention of most railways history enthusiasts. Return to Home Page from "Railways History"